Natural stone is porous and may allow liquids to penetrate the surface, which can cause stains, and can also breed germs and bacteria. Dirt and grime can make its way into stone floors, showers, and countertops. 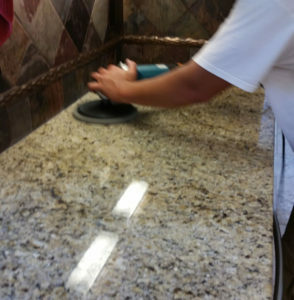 You can prevent staining by routinely having your granite and stone surfaces professionally cleaned and sealed. Groutsmith Temecula Valley specializes in cleaning and sealing porous surfaces such as granite, travertine, marble, limestone and other natural stone. Our technicians use PH neutral cleaners to clean and restore your natural stone and then seal your stone surfaces to its natural luster, preventing stains and grime to seep back in. Contact us today for a free estimate if you are in need of Natural Stone Cleaning & Sealing.